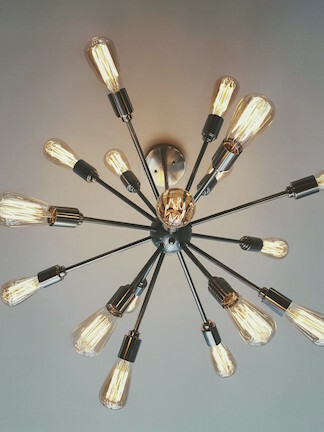 I've lived in my 780 square foot condo since 2009, and for the past 8 years I've been pining for a ceiling fixture in the living/dining room area. Well, I need not pine any longer because I now have the coolest, super fun, awesomest (yep, I'm making up words, I'm so excited!) lighting fixture this side of the Mississippi. This fixture makes me so happy! It just screams "FUN!," doesn't it? The downside is that this mid-century modern-inspired beauty contains 18 (yes, that's EIGHTEEN) lightbulbs, so our living/dining room space went from dark and moody to bright-as-the-sun BRIGHT! Good thing dimmers were invented because this fixture is a textbook case for why dimmers are necessary. Until the dimmer is installed, I'll enjoy gazing at my light fixture when it's turned off so as to not burn my retinas.